While installing Office for Mac, if you're unable to proceed due to "The installation failed'' error, here is how to fix it. 1. Open Finder and from the options menu, click Go -> Go to folder. 2. Then you’ll see an input box asking the location for Go to the folder. Put /Library and click Go. 3. Next, in the Library folder you’ve just arrived, find out the Automator folder. All you need to do is to rename this folder to Automator_Old. Once you’re done, you can close Finder. 4. 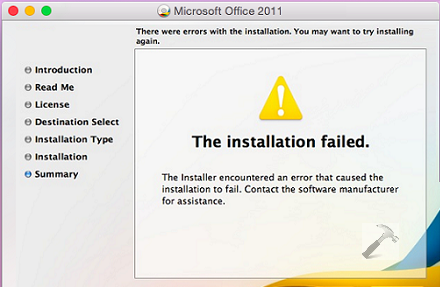 Finally, make another attempt to install Office for Mac, and this time you won’t face any issue. Once the installation is completed successfully, you must restore the original folder name in Library which we changed in previous step, i.e. change folder name from Automator_Old to Automator. If this trick is not working for you, checkout the other suggestions mentioned in Microsoft‘s support article.